After rolling out wearables apps across other platforms over the past few weeks, Spotify just released the first iteration of its Apple Watch app. The watchOS app will be rolling out to Apple Watch users over the next week, and you must have the latest version of the Spotify iOS app on your iPhone to download the app. Much like Spotify’s other wearable device apps, the program for the Apple Watch focuses on controlling playback on your iPhone from the watch. Users can pause, play, skip, and rewind their music, podcasts, and other tracks. They can also tap a heart icon to add new music that they stumble upon to their libraries. Most of these features, aside from adding music to your library, are available in Apple’s native Now Playing app that lets users control playback from nearly any audio source on their connected iPhone. The Apple Watch app also has Spotify Connect support, which lets users manage connections and playback with Bluetooth devices. Directly from the watch, you can choose which devices—like laptops, speakers, headphones, and others—you want to play music. Spotify emphasizes in its release notes that this is the first version of its Apple Watch app. Presumably, that means more features are forthcoming. Spotify mentions the ability to listen to music and podcasts offline in its announcement, and that would be a much-welcomed feature. Other apps like Overcast and Audible already allow users to download podcast episodes and audiobooks for offline listening so they can leave their iPhones behind and listen with paired Bluetooth headphones. So far, only Spotify premium users with Garmin Fenix 5 Plus and Samsung Gear devices can download tracks for offline listening, as that feature is already available on both of those platforms. 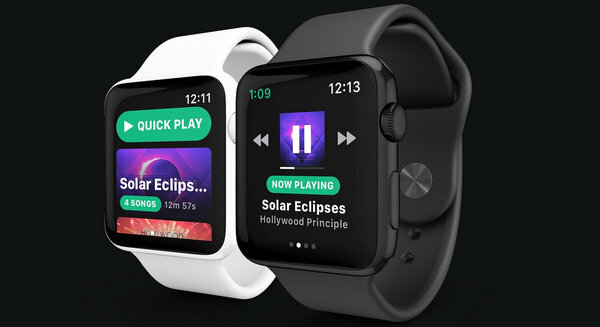 Overall, Spotify’s first iteration of its Apple Watch app is similar to its recently released Wear OS app—it’s a good start, but it ultimately won’t satisfy the needs of some premium Spotify customers who want the ability to save music to the Watch, or stream music over LTE. Currently, only the Apple Music watchOS app covers all of those bases. As we all know, the ability to play Spotify songs offline is proprietary for Premium users. So for Spotify Free users, if you want to listen to Spotify songs offline, the quickest solution is to use a Spotify music downloader that can help you download songs from Spotify even with a Free account. 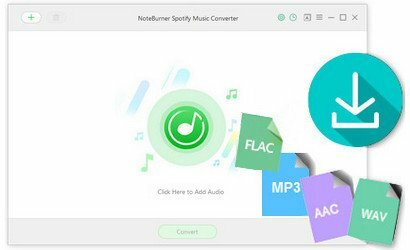 There are many user-friendly Spotify music downloaders on the internet supposed to help you complete this task, here you are recommended to try the most top-rated one, called NoteBurner Spotify Music Converter. It is a powerful Spotify music downloading tool. Built with advanced encoding technology, it is able to help both Spotify Free and Premium user download any song, album or playlist from Spotify and perfectly convert them to plain MP3, AAC, FLAC or WAV format. With its help, even the Spotify Free users can download Spotify songs to their computer and transfer to any other devices for streaming offline.